A new MoU between Air China and the Lufthansa Group to establish a joint venture covering Europe-China routes still awaits many – in fact, nearly all – details. 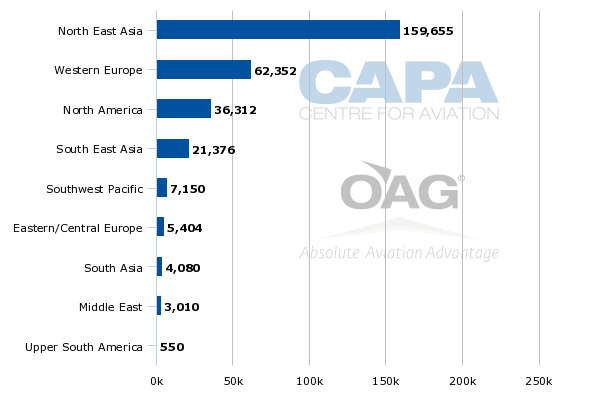 But it is not difficult to see this JV enhancing the position of each airline, assuming it meets EU competition requirements. Competitors will seek to grow existing JVs while establishing new ones. In some instances they will be responding to the Air China-Lufthansa JV, and in other instances they have been ready but held off due to an uncertain regulatory environment. Allowing another JV potentially increases the pressure for more to follow. But more immediately, and closer to the purposes of Air China and Lufthansa, the JV will at least partly remove lingering tensions between Air China and Lufthansa Group, the two largest carriers between Europe and China. Air China has overshadowed Lufthansa, with more growth to come as Air China sits astride what will be the world's single largest aviation market. But Air China requires precious beyond traffic that Lufthansa can control, as well as more extensive international experience. Between them, the two account for 35% of Europe-China flights, and 84% of Germany-China flights. For Lufthansa, a China JV adds to those in Japan and North America, while this is the first long-haul JV for Air China. Meanwhile Gulf carriers are not this JV's primary target; their access in China is relatively restricted and routes to Europe via the Gulf are circuitous. The Air China and Lufthansa Group JV will be implemented as early as the start of the northern winter 2014/2015 schedule, to commence in Oct-2014, according to a Lufthansa statement. The statement says the JV will provide "even better flight connections and services in the future" including greater flexibility to combine flights. But beyond these generic and non-specific details, there is no other public information. Presumably details are being worked through with European Commission competition authorities, but there are also a variety of commercial deals to be concluded between the parties. Each airline has pretensions for market dominance and achieving a suitable commercial balance will not be simple. In Oct-2013, then-Lufthansa Group CEO Christoph Franz remarked: “In the future, we will not only link our mutual hubs, but it will be important to also have direct links between major European markets and Air China’s hubs, and the other way round… It’s imaginable we could create a joint venture, but that takes time to develop and create a commercial balance.” Since Mr Franz's Oct-2013 comments, the situation has publicly progressed from a possibility the reality, albeit with details to be worked out, of an MoU to establish a JV, with details to be worked out. No doubt behind the scenes there have been significant negotiations and these are ongoing. The announcement was timed to coincide with German Chancellor Dr Angela Merkel's visit to China. Ms Merkel was present at the MoU signing. JVs by now have forged a well-trodden path of joint pricing (allowing different carriers' flights to be combined more flexibly), schedule coordination (enabling more connections and reducing connection times while also opening new routes), joint marketing and customer experience (such as through loyalty programmes). These are guidelines and not definitive; the Japanese-North American JVs feature higher pricing from Japanese carriers than their North American counterparts, a response to market demand. JVs can also differ in how - and if - they embrace financial performance (revenue or profit). Achieving a full JV would bring Air China and Lufthansa closer together. Air China has already grown in Europe, surpassing Lufthansa in the China-Europe market, with clear ambitions for more. But what must be apparent to Lufthansa is Air China's need for beyond traffic and overall international help. Chinese airlines are still on a steep learning curve in customer service and foreign distribution matters. These factors, while perhaps seemingly minor, can have a disproportionate impact on overall performance. Indeed, they can make or break an operation. Air China recognises that it may have scale but Lufthansa has quality with superior premium revenues as well as experience in running multiple hubs and airlines – something that Air China would like to know more about as it attempts the same in China. In these terms, the benefits perhaps appear to be on Air China's side, but Lufthansa cannot simply ignore its partner. To take, there needs to be give. A strategy that excludes Air China could impact Lufthansa in anything from bilateral access to slot times to more subtle nuances that would make its operation in China difficult. And Lufthansa has literally invested decades in relationship building with Air China. The benefits it dereives are arguably more opaque, but not necessarily less important. Provided there is a financial component to the JV, Lufthansa should in theory benefit from what Air China gains from Lufthansa. Like any marriage, there will be disagreements and even the pre-nuptial agreement will be hard fought. Undoubtedly Lufthansa's JV with Air China will take more time to bed down than its previous JVs in North America or Japan. With financially sustainable growth still to emerge from China, this initiative is one for the long run. Lufthansa has demonstrated this with its MRO JV with Air China, Ameco Beijing (40% owned by Lufthansa, 60% by Air China). This JV has experienced up and downs and an airline JV is unlikely to be different. Part of the Air China-Lufthansa announcement states that MRO cooperation will be expanded, but without any elaboration. The two carriers have a codeshare agreement, dating back to 2000, on routes between Germany and China. The codeshare agreement initially covered nine weekly Air China flights and 13 weekly Lufthansa flights on routes between Frankfurt and Beijing and Shanghai. Lufthansa is now Air China’s biggest long-haul codeshare partner, measured by the number of Air China-coded flights that it operates. The codeshare agreement now covers 36 weekly Lufthansa flights and 27 weekly Air China flights from Germany to China. In addition, Austrian Airlines operates five weekly flights from Vienna to Beijing with the Air China code (source: Innovata, week of 14-Oct-2013). The codeshares also cover short-haul flights operated by Lufthansa in Europe and by Air China in China. Of the Lufthansa Group's approximately 1,500 Europe-China flights in 2H2014, 87% – accounting for 89% of ASKs – fly to Beijing or Shanghai. These are large population centres (and catchment areas) where incomes are high with plenty of international business activity, allowing Beijing and Shanghai flights to largely sustain themselves with limited onward traffic to elsewhere in China (or other points in Asia, an attractive target, should the JV include that). Air China has a broader spread in Europe, flying from 13 European cities to China, mostly Beijing. (Air China also operates a Chengdu-Frankfurt service.) 38% of Air China's European flights are from Germany (23% from Frankfurt alone) while 54% are from Lufthansa Group hubs. Premium traffic on secondary European cities is limited, while even economy passengers on prime routes consist largely of low-yielding tour groups. Air China has more to gain in the medium term from improved connections in Europe. There is even scope for improvement in European cities that are not Lufthansa Group hubs. Lufthansa Group meanwhile has limited exposure to secondary cities in China; but, with greater Air China cooperation this could expand in the long term. In the short and medium term, connecting traffic will not be sufficient to support what are low-yielding flights. The Air China JV will immediately overtake in capacity size Lufthansa's JV with All Nippon Airways, which exclusively covers Japan. Lufthansa Group in 2H2014 will operate 1,478 flights to China compared to 1,232 to Japan, according to OAG data. 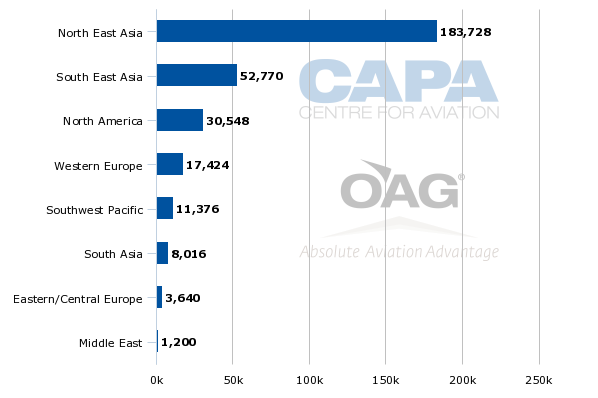 Seat deployment to China is disproportionately higher (approximately 320 seats per Chinese flight compared to 293 per Japanese flight) as Chinese flights use larger aircraft. Revenue levels however may be similar, as the Japan market can sustain rich yields. In the medium term there will likely be no flow on impact on ANA. The ANA-Lufthansa JV covers the Europe-Japan market while Air China-Lufthansa can be expected to cover only China and, at best, limited beyond markets. There is potential for the Air China-Lufthansa JV to allow Air China to better market sixth freedom itineraries between Europe and Japan via China, but this is relatively minor. Should this change, there would then be a more obvious impact on ANA. The bigger impact is arguably on Cathay Pacific, whose backyard of mainland China provides a large amount of feed for its European network, even with backtracking through Hong Kong. Cathay's position is unusual, as a oneworld member, but also a close partner of Air China's, with mutual cross shareholdings. But Air China tends to pursue its own agenda, independently of Cathay, even where the Hong Kong based airline might be disadvantaged. Air China already offers more destinations from Asia, and from Lufthansa Group bases in continental Europe it also has a wide range of onward destinations. A substantial Air China-Lufthansa JV Air China is liekly to work to Cathay's detriment, although Cathay will not walk away empty handed thanks to its stake in Air China. In its favour, Cathay has a very high quality brand and premium product, with a faithful following. Wresting the eastern seaboard premium market away from it will not be a pushover. Asiana and Korean Air will also be impacted as they transport Chinese passengers to Europe, but in lower volumes than to North America. Taiwanese airlines are prevented by bilateral restrictions from carrying outbound China passengers beyond Taiwan. Chinese routes account for 6.0% of the Lufthansa Group's 2H2014 ASKs, more than Japan's 5.2% but well below the 29% in North America covered under Lufthansa's trans-Atlantic JV. An Air China-Lufthansa Group JV will account for 35% of flights in the Europe-China market based on 2H2014 schedules filed with OAG. This also represents 36% of available seats. Air China is the largest carrier between China and Europe while Lufthansa passenger airlines is the third largest (China Southern is second). SWISS and Austrian are smaller players, but together help Lufthansa Group be larger than China Southern. When viewed as a group, Air France-KLM is the second largest entity between China and Europe and is larger (14%) than the Lufthansa Group. However, the Air China-Lufthansa Group combination has a slight edge over a (theoretically) combined Air France-KLM China Eastern/China Southern grouping (33%). Germany is the largest European country to receive Chinese airline flights. 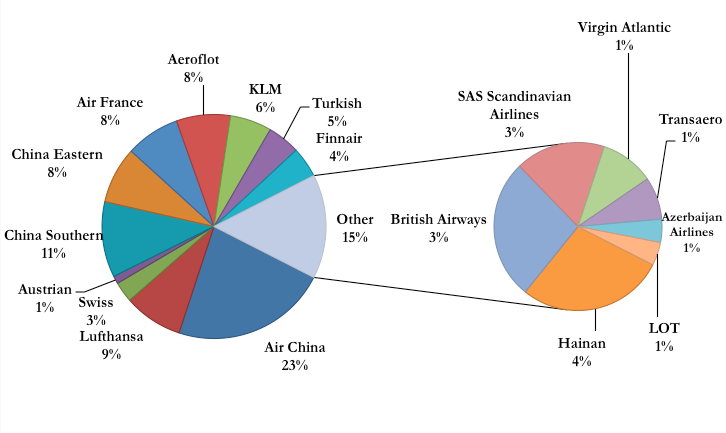 25% of Chinese carriers' European flights, and 27% of ASKs, are bound for Germany. This is largely supported by Air China's overwhelming presence in Germany. A combined Air China and Lufthansa will thus gain a significant presence in the Germany-China market. Germany is China's largest European trading partner while China is Germany's third largest. Air China and Lufthansa will account for 84% of flights and 88% of seats. Although this is a significant majority, it is lower than what All Nippon Airways and Lufthansa have in the Japan-Germany market. 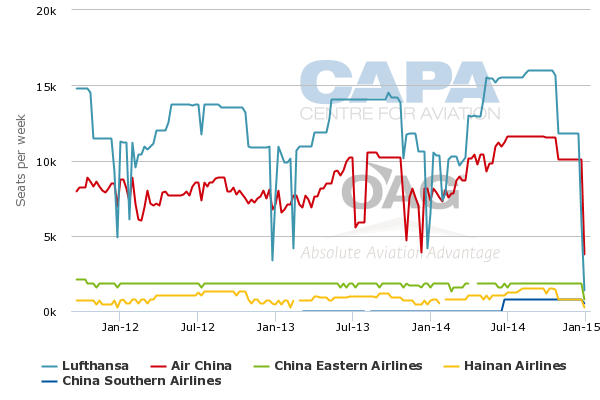 The Air China-Lufthansa JV is likely to be misconstrued as having Gulf carriers as its primary target. Gulf carriers have heavily restricted bilateral access to China, much to their frustration. 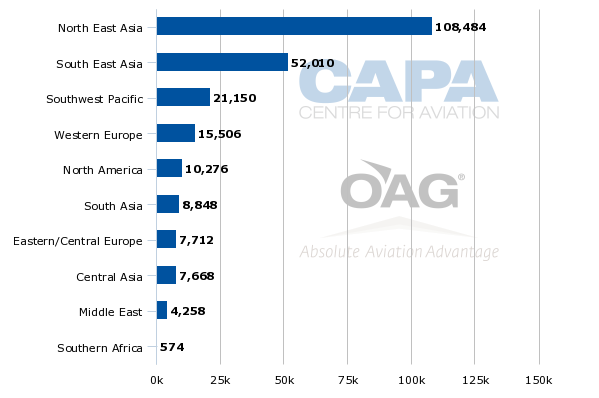 Gulf carriers have fewer weekly flights to all of China (87) than they have to just Bangkok (91). Further, Europe-China routings via the Gulf to northern Europe are more circuitous and thus less desirable than Europe-Southeast Asia routings via the Gulf, for example. While an advantage over Gulf carriers may be a nice benefit from the JV, that can hardly be a major motivation for it. Lufthansa was investing in the Air China relationship long before the Gulf carriers became a force. The passenger profile on Gulf carriers' China routes is clearly different. On Emirates' China routes, six of its 20 largest beyond markets – representing 16% of transfer traffic – are European, according to OAG Traffic Analyser. On Emirates' Bangkok and Singapore routes (which are less circuitous via the Gulf), European markets comprise 53% of transfer traffic and 17 of the top 20 transfer markets. Interestingly, the two largest European markets for Emirates' China routes are Madrid and Rome, two hubs whose local airlines have failed to capitalise on Asian growth; Iberia serves no Asian points at all, while Alitalia serves only Japan. (Alitalia can be expected to grow in Asia – and China specifically – following Etihad's recent investment.) This is traffic local airlines have not capitalised on. It can most certainly not be called traffic Gulf carriers have "stolen", to use the word of detractors. If Alitalia and Iberia have not exploited this demand, there is no justification for Lufthansa (for example) being more "entitled" to it than a Gulf carrier. Nonetheless, a JV with Air China would put Lufthansa – for once – at the vanguard of change. Gulf carriers would need to obtain an amount of Chinese traffic rights they are unlikely to achieve in the medium term if they are to change the market the way they have in Southeast Asia or India. Leading the change in China could help Lufthansa begin to make up for what it has lost elsewhere. The Air China-Lufthansa deal is not the first Euro-Chinese JV but is likely to be the largest. Air China has a revenue and cost sharing agreement with Cathay Pacific on Hong Kong-mainland China routes while China Eastern and Air France have a JV between Shanghai and Paris. China Southern and Air France have a JV between Guangzhou and Paris while China Southern and KLM have a JV between Beijing and Amsterdam. So although there are already JVs with Chinese carriers, the Air China-Lufthansa JV is significant since Air China is the country's largest international carrier. This not only gives the JV considerable size, but by having a JV with China's largest international carrier, and one intrinsically linked to Beijing, China is signalling it will welcome further JV developments. Air China is the largest carrier in China's two key long-haul markets of Europe and North America. China Southern is the largest in the smaller Australian market. Competitive pressure will urge China Eastern and China Southern to expand their respective JVs with Air France-KLM, although in these scenarios Air France-KLM will share Lufthansa's concerns about unduly empowering a competitor who will one day (quite soon) be much bigger than they are. Yet with Air France-KLM already having a larger Chinese presence than Lufthansa, and not being optimistic in the near future about secondary city growth, they may find it acceptable - with little to lose - to maintain the status quo. Beyond supporting the big three, Beijing's regulatory expansiveness will be tested if JVs are proposed amongst other airlines. British Airways and Finnair for example might find a favourable combination to China, just as they have done jointly to North America and more recently Japan. The internationally ambitious and privately-owned Hainan Airlines may look for its own partners. JVs with China will emerge from other regions. North America is the obvious pick, but since the US requires an open skies agreement as a precondition for a JV, these developments will take longer. In the interim, closer partnerships are likely, although once again prospective suitors like Delta are wary overly empowering large competitors. Delta, via its Northwest heritage, arguably comes from a stronger position when negotiating a JV. There are details about a JV still to emerge from Air China and Lufthansa, and this will shape the timeframe of JVs in China; but no doubt the path is now being established for more partnerships involving Chinese airlines. While these bring opportunities, they also bring challenges – both perhaps on an unprecedented scale. Lufthansa's patient steadiness, as opposed to speedy competitive reactions, may prove to be the more successful course.